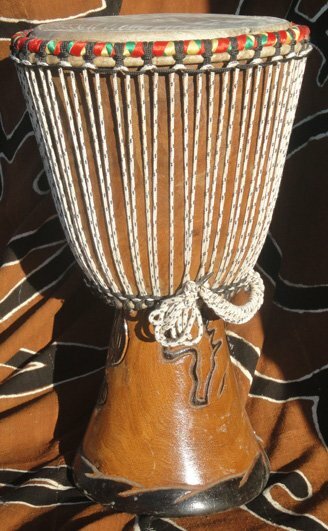 This Djembe drum's shell is carved from a heavy wood the Demba which features high density and tight pores making this a very bright drum. With a 14" head (14" ring to ring and 12.75" playing surface) and 24.5 inch height it is the perfect size for a lead drum. Goatskin top cloth protected bar rings and double-braided polyester cording add to the quality of this drum. Tunable for years of play. Decorative designs on the shell may vary.